Tag Archives: why do Indonesian feed their kids? I have a lot of respect to the nannies in Indonesia, their job is tough. In order to feed their employer’s kids, or should I call them the Queen and the King, they have to run around the mall, wedding hall, house, park or other places, while holding a bowl full of rice. The nannies, who are often wearing white, pink, or blue uniform with a rucksack on their back, have an important job to chase the kids and to feed them. Although we, Indonesians consider eat while walking (or even running) as rude, when it comes to kids, we make an exception. Some, if not most, kids in Indonesia are not taught to eat by themselves. They need to be fed so that the nannies have job so that their clothes and the tablecloth remain clean. Apparently, appearance is more important that the ability to be independent. Being fed feels good, the hands could freely doing anything else, while the mouth can chew the food. Maybe that is why many people do not want their parents to stop it until their adulthood. The menu however is replaced by cars, money, apartment, house, allowance for the monthly bills, or a job. Providing for children is never wrong, but at some point the parents must teach their children to stand on their own feet. If the West opt for seating dinner during wedding party, many Indonesians opt for standing party. Some people might find it impolite, but standing party is the only way to accommodate hundreds if not thousands guests. 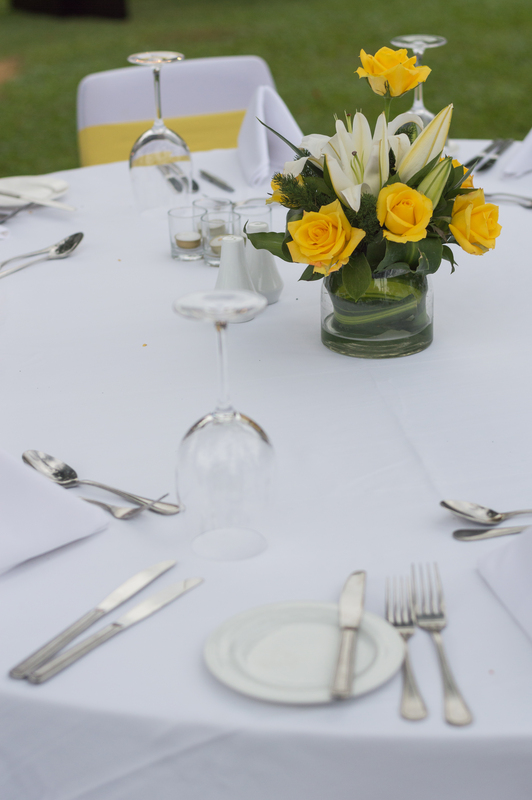 In most of our wedding parties, chairs and tables are only reserved for VIP guests or family of the bride and groom. Eating while standing is impolite, but again, we make another exception. Speaking about wedding, there a general rule about it, when invited, eat every single thing served at the buffet table. Mix the salad with the rice, pasta, beef, chicken, fish and the soup. If one can put everything in one plate, why put it in different plates? Our desire to mix food, might have been the reason for the invention of nasi campur, rice which served with many condiments. This meal allow us to taste as many food as possible. This might explain why set menu is not popular in this country, it is just too boring and not varied enough. Therefore, the next time you see Indonesia seating in a fancy French Restaurant, sharing foie gras or steak please do not be surprised. As I mentioned above, Indonesians tend to want to taste as many food as possible. Mr. Foreigner Chef, please do not complain about this. Any foreigner Chef who work in Indonesia should also never be offended when Indonesians put ketchup on foie gras or salad. No matter how good (and how expensive) the food is, if it is not spicy, then it does not deserve a place in the stomach. Providing a bottle of ketchup, soy sauce, vinegar, sambal on the table is a must. Italian might find it sinful to put sambal in spaghetti carbonara, but again, if they want to rest peacefully in the stomach, then it has to be spicy. One might find joy in juicy steak, while other find the comfort in a spicy steak. Beside proper three times per day meal, Indonesians also have ngemil time! If tea times come in the morning or in the afternoon, ngemil or snacking, comes at anytime. We love it so much that we do it all the time, even during working hour. Having gorengan, kerupuk (chips), keripik (also chips), bread, and/or other snack during working hour is important for us. Never mind the silence that needed by the other colleagues, just keep chewing. Having a box of snack during meeting is also a common practice here. An institution or company might be considered miser if there is no snack served. Should there is a budget limitation, then at least coffee or tea should be provided. Make sure you put few spoonful of sugar to show that your company is wealthy enough. Another interesting thing about Indonesians is that many of us remember the lesson taught from our tender age: to burp after meal. These babies who have the elephant’s memory, bring the lesson to their adulthood and do it anywhere they want. Some do it at warung (small and often less expensive eatery), while some do it at restaurant. Basically everywhere. Burping, sometimes, is not considered rude here. Finally, foreigners are often surprised by our table manner, custom and etiquette. They often feel that Indonesians are just impolite. They are able to afford expensive meal but lack of manner. They also find it weird that we eat pre-cooked and re-heated meals for breakfast, lunch and dinner. What these people should remember is that we, Indonesians enjoy food in different way, it doesn’t mean that we do it better, but not worse either. We just eat different things in different way and we are happy with it. If there is only one thing that you should complain about our eating manner is when one could not close the mouth while chewing. That you can complain!